It’s been said that fortune favors the bold. Maybe fortune favors the ambitious, or the confident, or the well prepared. But what is this fortune we seek? 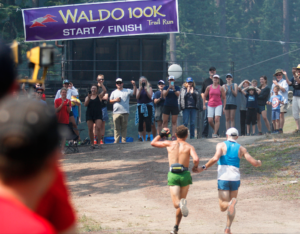 Last year at the 2016 Waldo 100k I sought after a Western States lottery qualifying spot by finishing all 62.5 miles, run, walk or crawl. It honestly took all those things. But this year I sought to push myself beyond my expectations into the depths of discomfort and turn some heads doing it. Months of mental and physical preparation led me to race day looking calm on the surface but containing a civil war of emotions. There are always nerves going into any race, no matter how prepared you feel, hoping that expectation lines up with reality. At some point you can either roll over and let that fear overcome you, or you can put anxiety on the back burner and control your own destiny. Jeff and I showing off our spirit-animal temporary tattoos. Me: Stag. Jeff: Unicorn. I’d been looking forward to this race for so many reasons. One of the big ones was getting to run with my buddy Jeff that I had met back at the 2015 Vermont 50. We shared about 20 miles getting to know each other back then and he ended up beating me by 10 minutes, a favor I’d like to return to him at Waldo! 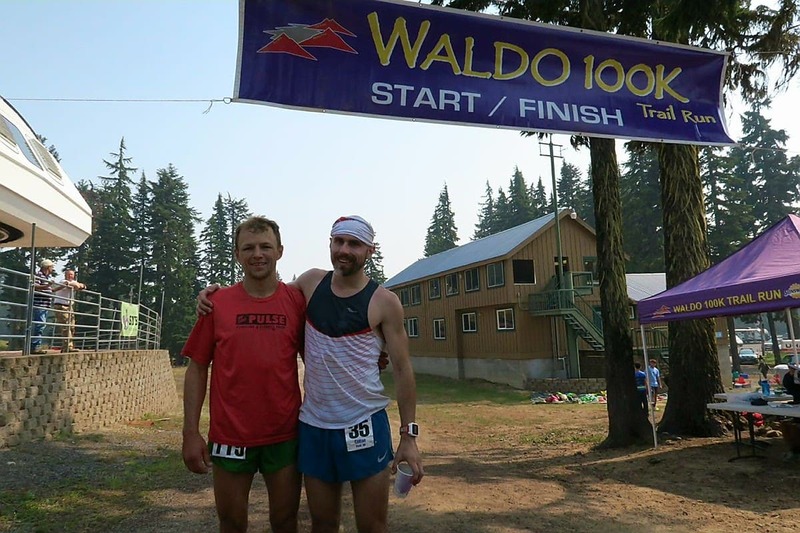 And with him as my prerace pick to win this Waldo 100k, it was going to be fun running with him for a while! 62 miles is a long way so sharing a bunch with a buddy would make everything easier. We began the race together, smiling, with almost 200 other athletes not knowing what the day would hold. At the top of the first climb we were already stress-free in casual conversation about shampoo, tagging geese for environmental tracking, girls, our race strategy and buffet foods. Classic mid-race ultra stuff. We found ourselves in the lead at the first aid after passing a guy, Duke, who was using a low-quality headlamp. He hung with us a bit but dropped back to play it safe on a technical downhill. We were care-free headed up the first climb to Mt Fuji when we got caught by Yann, a Canadian decked out in Salomon gear. We shared a few miles and some laughs before letting him disappear a couple minutes ahead. I’ve never been so fine letting someone else take the lead, especially after I had already fallen and rolled once or twice. Thankfully my Nike trail shoes were protective enough to be easy on my (already black) toenails. Jeff and I hit the summit nearly together shortly behind Yann and also Duke, who had made his way ahead of us on the climb. “What do you think of those guys?” Jeff asked me. We chatted about the gear they were using, including Duke’s waist pack and Brooks Launch road shoes with trail gators attached. “That’s pretty nontraditional for an event like this so he seems pretty experienced to know what works for him. Could be a competitor and definitely a Top 5 guy.” Our group of four ebbed and flowed, joining together, spreading, and shuffling order. 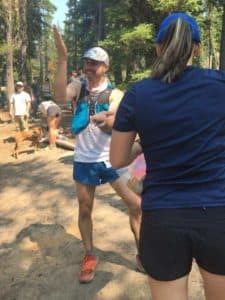 We all got to know each other fairly well; where we are all from, what we do for work, our ultra experience, a little bit of what to expect on the Waldo course, etc. 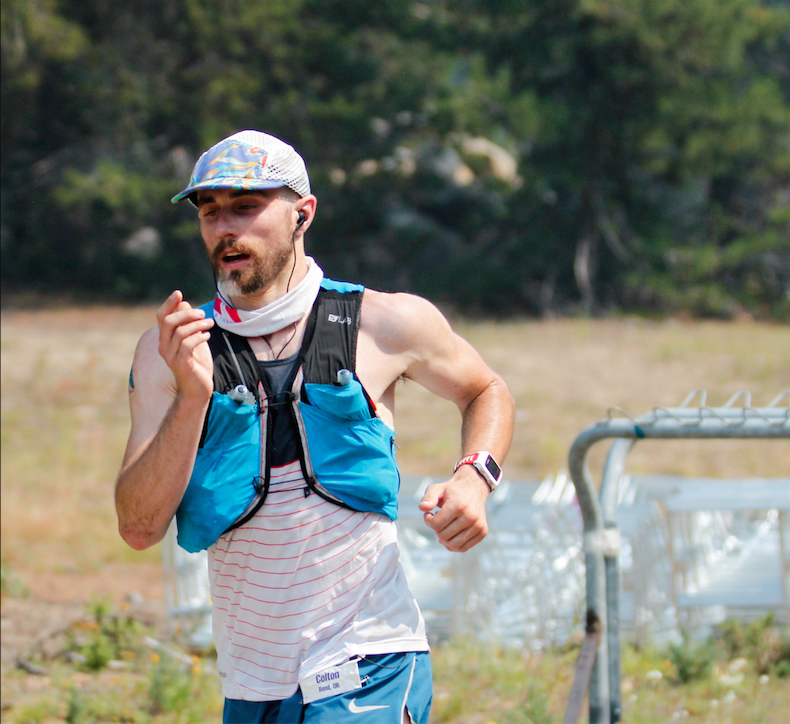 We venture through the Mile 20 Mt Ray aid station with the rest of the Top 10 shortly behind. It was frantic, high energy, chaotic and I almost left without a restock of Gu gels for the next 10 miles! Fortunately my crew came through in my mental lapse and I left with a small group of others. It was important for me to stay in contact with the leaders at this point because this was my go-spot. This next portion has very runable sections and a little bit of technical terrain which is my bread and butter. It was time to make a hard move. At 23 I passed Yann and he slowly drifted back as I knocked off a series of low-7:00 miles to put a gap on the field. There was no hesitation in the pace adjustment and I moved deliberately, cruising along a stretch of Pacific Crest Trail (PCT) down into Charlton Lake, the halfway point on the course. I’m attaching a video below because this is the best way to describe how I felt at mile 32. In 10 miles I had put a seven-minute gap on Yann and then Jeff was a minute back from him. I know better than to count this as a victory, especially heading into the hottest and most exposed section of the race, but I was still having some fun executing my race plan to the letter. I left Charlton Lake feeling exhilarated and confident knowing every inch of the next 12 miles. I did a 2-loop training run out there on a 100 degree day this summer, so there’s no way the next section would be as grim as that day. My Feetures merino wool socks were keeping my feet in great shape as a small stream crossing kept them cool. The incredible volunteers loaded my Salomon Sense Ultra 5 pack up with ice at the Charlton Lake aid to melt over the next few sunny miles. This is where racing smart comes in. Last year I felt good and kept pushing through the heat and burned more energy and calories than I was prepared for. This year, the exposed section would be time to chill and have fun, not having to think about directions at all. Thomas, one of my coworkers, was at this aid station at mile 37 and saved me a ton of time navigating my drop bag with a replenishment of Gu gels to get me to the aid at mile 44. There’s just a long grind of a climb to get there. The heat wasn’t nearly as bad as I had planned for. Last year was 92 degrees, but this year the high was only about 80. That makes it much more manageable for fast running and climbing in direct sun. As much as it would be great to say I felt awesome all day, that just wouldn’t be true. The climb up to the Twins really is not fun. It’s not pretty, it’s boring, the whole trail looks exactly the same, and you can’t see the top until the last half mile of the 45-minute grind. Not to mention it’s also at mile 40. This was also the spot that Jeff had voiced his interest in making his move, so I was getting anxious expecting him to come into view at any point. Little did I know, at that point he was dropping back, just trying to survive some pretty serious dehydration. My plan was to get over the climb and down to the Twins inbound aid at mile 44.7 in the lead and feeling intact. Nobody has any idea what I was doing. Karate chop in good spirits! I did my best to bomb down the hill into the aid and do an assessment of my condition. What do I need? Change of gear? Soda? It turned out to be some Coke, a restock of gels and my headphones just in case. It was the last the time we get to see our crew before the finish 17 or so miles later. Knowing there is still the biggest climb of the day left, when my mom asked how I was feeling I grinned and replied, “I still have some quads left. I’m ready to go. Bring on Maiden.” A year ago this 4-mile, 2,600 foot climb destroyed my quads on the way up and then forced me to run 9 miles worth of smooth downhill to the finish, which went about as well as you’d expect with no quads. But I also realized I didn’t have a big gap anymore. My body preservation going over the Twins allowed Duke and Yann to close a bit of the gap from earlier. There was word that 2nd place was only 3 minutes back and I took off to get redemption on my nemesis, that *ahem* Witch of a mountain. But I was a different runner a year ago. Bring on the climb. There’s no hiding out there. The air is thin, the trail is rutted out, and the sun is hot on your back. Tired hands even have a hard time gripping wet, sweaty knees as the climbing is measured in hundreds of feet per mile. The ice in the pack melts to keep you cool, but the water runs down to wet your shorts and chafe your thighs. All there is to do is keep your head down and trudge. 3 minutes is no time at all over 17 miles. That’s not a comfortable situation. I’d been running alone for 30 miles and that was not about to end now. This was my time to prove the hours of preparation were worth it and execute this race plan. I couldn’t see him, but I knew Duke was climbing hard. How could he not be? I popped my headphones in to have a little melodic tune as my footsteps and heartbeat created their own rhythmic sound. Unfortunately familiar quad and hamstring twinges threatened to rain on my uphill (literally marching) parade. Don’t stop. Don’t you dare stop. I doubled on gel intake on the climb to stock up my system and finished everything I had in my pack. The final quarter mile is an out-and-back to the summit with loose golf ball sized stones. It makes for a brutal finish to an annoyingly exhausting hour of life. There wasn’t time to enjoy the view from the summit because the gap behind me was closing. I didn’t know who was behind me but I knew they were right there. On that short final section, I came face to face with both Duke and Yann! That is definitely not enough of a gap going into a section that can be very fast if you have legs left. The gap was 3 minutes to Duke at the summit and another 2 to Yann. In the ultra world, that small of a gap with 10 miles to go is a sprint to the finish. Duke looks at me and says, “Hey man! How ya feeling?” Really? We are sitting 1 and 2 with a small gap and you’re going to ask how I feeling? “Ready to have some fun!” I replied, hoping to throw him off my aching trail. I do my best navigating a section of called “Leap of Faith” that drops 1600 feet in less than 2 miles with lots of sand and loose rocks down to the final aid station without looking back. The pebble that had been in my shoe for over an hour slid to the front and poked my big toe every step. At the Maiden Lake aid station was another Bend local, Scott, who does the Waldo course markings and runs the final aid with seven or eight miles to go. He recognized me immediately. “DUDE! I was just telling these guys how last year you bonked your face off! !” Thanks for the reminder, Scott. Knowing the gap was small I tried to get out quick but he asked if I needed any Mermaid Milk. What is he talking about? I just ignored it, snagging a cup of Coke and adjusted my Nike shorts. “Turn around,” Scott said, “I know you want some Mer-Milk!” What is he talking abo—OH! Standing there was a guy dressed up with a coconut bra, wig and what looked like a Mermaid skirt. He held the bottom of a watermelon carved out into a bowl. “What is that?” I asked. Scott replies, “Dude that’s all you need to get you through the rest of this race! You may as well leave your pack and all that other stuff here. This will get you through! Drink the Mer-Milk!” I shrugged. What’s the worst that’s the worst that’s going to happen? The Mer-Man feeds me whatever was in that watermelon bowl and the group lets out a cheer. Part of me expected it to be actual milk, but most of me was expecting it to be alcohol of some kind. It tasted like neither. And to be totally honest, to this day I don’t know what I drank out there, and I probably don’t want to know. Side note: Jeff later told me that they also encouraged him to drink the Mer-Milk when he came through in 5th place, and they cheered “5 for 5!” when he did. So obviously it was the right decision. Evidence of the pain cave. Seven miles to go. Seven miles to empty the tank. Seven miles to not drop 3 minutes to the charging competition. Every step felt as though bricks were being dropped on my quads and calfs but this was no time for low-impact shuffling. My Buff was soaked with sweat doing its very best to keep my neck cool, but the afternoon heat was starting to take its toll. Winding single track of PCT kept me out of sight of the closing competition for a while, until we finally caught a glimpse of each other on a straight shot with 4.5 miles to go.NO! This is NOT happening! Every ounce of my being is doing what it can to hammer out miles. I begin to feel the gravitational pull of Willamette Ski Pass Area, site of the start/finish line. I also began to feel the lasso Duke had around my waist, reeling me in. One and a half miles separated us from he finish line. 10 minutes worth of everything we had left to give is all there was to decide who would take the title. I still ran in front, never allowing him to step around me on the trail. But as we popped out onto the final stretch, an unimproved Jeep road leading to the finish, he pulled up alongside me. We can see the finish line just over a quarter mile away as we are both pumping our arms wildly. Some sprint finishes are a little back and forth duel, but we remained shoulder to shoulder, neither man giving an inch. Our steps were almost in unison as both our families stood at the finish line screaming and hollering. They looked at us, at each other, back at us. Everything came down to the final quarter mile.. the final 200 yards.. the final 50 yards. “Yeah, man! Totally.” He was pumped, I was pumped, and our families were losing their minds. 30 yards to go and the cheers are deafening. I extend my hand, reaching out to him. He slaps me a low-5 and I clasped on, not letting go. We raised our hands and charged across the finish line… victorious! 10:01:05 for the win. And for the tie. Never did I ever picture coming in for the win of a race and being so happy to tie. It was the sign from both of us as ultimate respect for what the other had done. On this day, we all got to appreciate a wonderful moment and share in this celebration of triumph. I promptly collapsed over to rest my hands on my knees, having a hard time making full sentences, not sure what I even needed following the finish. What did I need? Coke? Water? A chair? Who knows. It was just that everything I’d wanted for so long had come true. The Waldo 100k is one of the reasons I moved to Oregon. It was the original catalyst behind this phase in life and I just won the race. It’s absolutely baffling to think about how things have changed in a year, and how much I have trail running to thank for that. Air in my lungs, shoes on my feet, love in my heart. What more could I possibly need?